"Accompanied by his faithful Labrador Dickens, and working in tandem with the increasingly exasperated Inspector Geordie Keating, Sidney is called on to investigate the unexpected fall of a Cambridge don from the roof of King's College Chapel; a case of arson at a glamour photographer's studio; and the poisoning of Zafar Ali, Grantchester's finest spin bowler, in the middle of a crucial game of cricket. As he pursues his quietly probing inquiries, Sidney also has to decide on the vexed question of marriage. Can he choose between the rich, glamorous socialite Amanda Kendall and Hildegard Staunton, a beguiling German widow three years his junior? 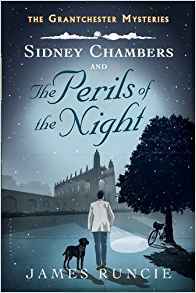 To help him make up his mind Sidney takes a trip abroad, only to find himself trapped in a complex web of international espionage just as the Berlin Wall is going up. Here are six interlocking adventures that combine mystery with morality, and criminality with charm." There were a modest number of food mentions in the book, among the more interesting were "a few thin pork knuckles and some sauerkraut" Sidney was given in an East Berlin prison cell, all the food at the Cricket match fete, including his housekeeper, Mrs. Maguire's Victoria Sponge, her shortbread, and of course what she served up for Hildegard, Toad in the Hole, or what Mrs. Maguire announced as "Sausages in batter." 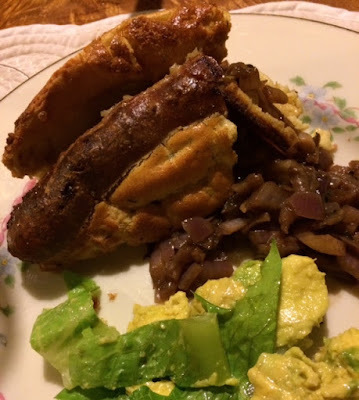 "Toad in the hole or Sausage Toad is a traditional English dish consisting of sausages in Yorkshire pudding batter, usually served with onion gravy and vegetables. Historically, the dish has also been prepared using other meats, such as rump steak and lamb's kidney. Batter puddings only began to be popular in the early 18th century. Jennifer Stead has drawn attention to a description of a recipe identical to 'toad in the hole' from the middle of the century. In 1747, Hannah Glasse's The Art of Cookery gave a recipe for 'pigeon in a hole', calling for pigeon rather than the contemporary sausages. The dish appears in print as early as 1762, where toad in a hole is referred to as a 'vulgar' name for a 'small piece of beef baked in a large pudding'. Isabella Beeton in 1861 gives a recipe calling for rump steak and lamb's kidney. 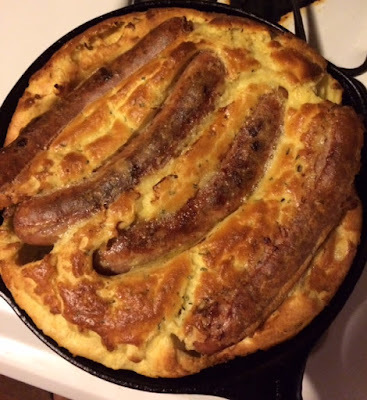 The origin of the name 'toad in the hole' is unclear. It is often thought to refer to the sausages peeking out through the gaps in the batter." Put the eggs in a blender and whirl at high speed for 1 minute. With blender running add the milk gradually, then slowly add the flour and continue whirling for 30 seconds more. AND most important: Cover with wrap and place in fridge for a minimum of 1 hour or overnight. While it's chilling you might make your gravy, a good recipe for which is here. I wasn't all that crazy about Jamie's. Preheat oven to 425F when you are ready to begin cooking, and your batter has been chilled. 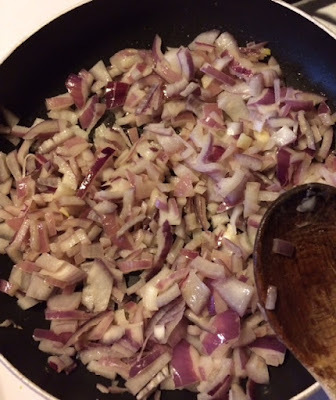 Get out a cast iron skillet (preferably) and heat to medium high. 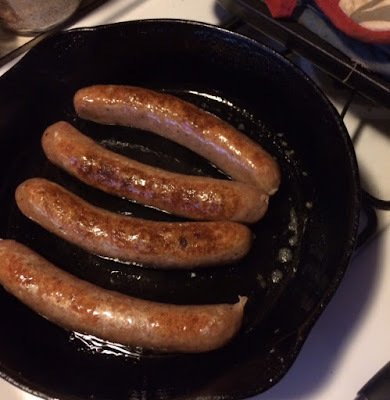 Brown the sausages nicely on all sides. Pop the garlic and sage into the blender, and whirl a bit. Now pour your chilled batter directly into the hot pan and transfer to oven. Bake 30-35 minutes or until puffy and lightly browned. Just lovely comfort food, and will serve four easily. Unless one is a hungry teenage boy. 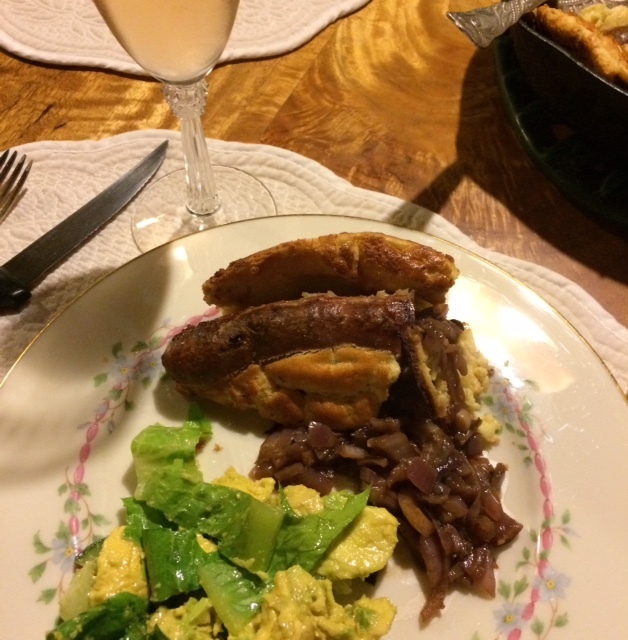 We had a chunky red onion "gravy", so called by Jamie Oliver, on the side, with a small salad. This will be served up over at Beth Fish Reads for her Weekend Cooking event, and at the April edition of Foodies Read.. Stop by and join in for some excellent reading suggestions and lots of good food. James Runcie is also the author of "The Discovery of Chocolate" which several blogger groups have been reading. I found it way too full of historical errors and gave up on it, though. Your "toad" looks quite delicious. Glad there's not too much toad in it! I know Mae, and he definitely improved over that first novel of his. 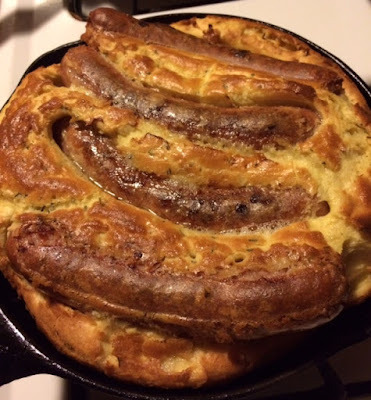 I've never make Toad in the Hole, though I ate it when I lived in the UK. I'm going to have to give it a try. I always thought that was a cool name for a dish! It looks good. I've eaten toad in the hole a couple of times, but I haven't made it myself. Looks good! I didn't think I would want to read another Runcie novel but you have me intrigued with this series.